One of the many Jesuit slogans inspired by St. Ignatius of Loyola is “finding God in all things”. This is not merely a figure of speech, but a deep belief that God as Creator is present and active in creation. It does not mean that he is like a mechanic who is constantly tinkering with a machine, because God is not a “thing” in the universe along all other things. Rather, it means that he is the source of being. Through his creative power, he holds all of creation in being. It is he that ordains the potency of all being to particular form and concrete activity. All of creation, which is, on its own terms, merely contingent in nature, finds in him an ultimate objective ground, an initial cause of existence, and a final cause of meaning. Christians of the mediaeval age were keenly aware of God’s presence in the world. More than likely this had something to do with their closeness to nature. And it became popular for them to draw an analogy between the natural world and Sacred Scripture. According to this view, both are Books in which Christ reveals himself. 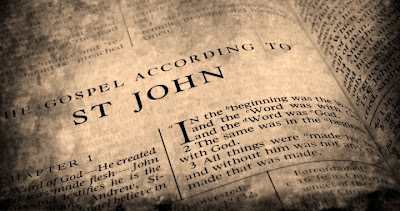 Recall the beginning of John’s Gospel. There, Jesus Christ is presented as the Word of God. The Greek word being translated here is λογος (logos), which can be translated as “word”, but has a much broader semantic range and can signify “reckoning”, “reason”, “ground”, and so on. Christ is the Creator who endows Creation with meaning. Just as Sacred Scripture is a text about Jesus, the Word of God, so is creation also a “word” of God. God has revealed himself to us both in the intelligible order of the created universe, and in a collection of divinely inspired literature. Both, in the final analysis are “books” that are about one character and protagonist: Jesus Christ. This mediaeval analogy is fruitful for understanding how to discover God in the pages of Scripture. In nature, sometimes it is easy to see God’s presence—most obviously through miraculous events which some are privileged to witness. But ordinarily, I think everyone has moments of epiphany from the beauty and order of nature, when the transcendent ground of reality is revealed as though a curtain has been briefly drawn away. On the other hand, sometimes God’s presence is difficult to discern in the created order, particularly when evil and suffering are present. Nevertheless, many holy people have shown us how to find God in these places too: think of a Fr. Damien, a Mother Theresa or a St. Marguerite Bourgeoys. In the same way, God’s presence in Sacred Scripture is sometimes brilliantly obvious and other times subtly hidden. Sometimes he is the protagonist of the story, as in, for example, the story of the Exodus; in other places, such as the Song of Songs, his name is not even mentioned. How then, can we recognize the presence of the Lord in Scripture and encounter him there? One approach is to consider the various “senses” of scripture. The allegorical sense. All of Scripture ultimately points to Christ, and the allegorical sense is that in which the mysteries of Christ are foreshadowed or reflected. The moral sense. Scripture speaks to our conscience and helps us to discern what Christ is calling us to. The moral sense helps inspire us to live just and upright lives. The anagogical sense. This is from a Greek word meaning “leading”, and signifies that Scripture points to the future and has an eschatalogical significance. The Bible not only tells us how God has acted and is acting, but where he is leading us. The moral what you should to do, anagogy where you should head. Consider the passage of Israel through the Red Sea. The literal sense is that God rescued the Jewish people from slavery. The allegorical sense foreshadows baptism in Christ as God’s rescue of his people from the slavery of sin. The moral senses are many, but one might be the need to trust in God’s providence in difficult situations. The anagogical sense is that God is leading us from this present world of slavery to an eternal homeland. The Exodus is a classic example of how the senses of Scripture are at play, but they can be sought throughout the Bible and used as a tool for seeing God’s presence in a particular passage. Take, for example, the following verse from the Book of Proverbs: “Listen, my son, to your father’s instruction and do not forsake your mother’s teaching” (1:8). The literal sense is quite clear: be attentive to your parents. The moral sense is closely related, for in this case, the verse itself is an ethical imperative; upon reflection, though, one can be led to many other moral considerations, such as the need for humility, the importance of venerating the wisdom of elders, and so on. The allegorical sense could point to Christ’s obedience to God the Father: “Very truly I tell you, the Son can do nothing by himself; he can do only what he sees his Father doing, because whatever the Father does the Son also does” (John 5:19). It also calls to mind Christ’s obedience to his human mother, the Virgin Mary (e.g., John 2:1–5, Luke 2:51). The anagogical sense is not as straightforward in this example, but perhaps could perhaps point to a future state where we will be fully in the presence of our heavenly Father and will perfectly hear and obey his will (e.g., Rev. 21:22–27). Seeking for both the literal and the spiritual senses in Sacred Scripture can help us better to hear God speaking to us when we listen to the readings of the mass, when we pray the Liturgy of the Hours and when we read our Bibles. It is essential to keep in mind that the two senses belong together—much in the same way that appearance and intelligibility coexist in the Book of Nature. In the created order, reality is not merely what we see, but rather, what we see leads us to reflect on what the meaning of the appearances truly is. For example, when two lovers first meet, the actual circumstances might be quite prosaic: perhaps they happen to take the same class in university and one day glance at each other. The “literal” or “historical” meaning of this event is simple and commonplace. It is a mere glance. But in reality, it has a much deeper significance, for it is the beginning of a whole relationship. The seemingly simple meeting becomes charged with significance. It will be recalled and scrutinized and thought about with pleasure by the couple for the rest of their lives. The event of a second can arrest someone for the rest of his life, like the sight of a girl in the white dress in Citizen Kane. Clearly the literal meaning and the “deeper” cannot be fully separated. The glance in the classroom is more than a glance, and is not fully explained by reducing it to a glance; but the deep meaning of the first-time encounter cannot exist without the concrete fact of its occurrence. In the same way, the literal and spiritual meaning of Scripture exist together. The spiritual meaning of the Crossing of the Red Sea is baptism, salvation, the Heavenly Jerusalem; but our salvation happens in the context of the concrete world of creation. Real slaves are freed from real masters; fresh, bracing water is poured over an infant’s head as he is born again in the Spirit. Jesus really is present to us in a collection of books that has been preserved over millenia. The books consist of white paper covered with little black symbols; those symbols stand for words, which stand for literal events and ideas. Jesus’s presence is mediated by these concrete events and ideas, but we will not discover this presence if we do not delve deeper and ask to be shown the text’s spiritual significance. Nor will we find the spiritual significance unless we are diligent to understand the literal meaning from which it springs. Like nature herself, Scripture is a Book in which Jesus awaits us, and its meaning and depth cannot be exhausted. You nailed it Adam. This is the heart of DV. I will share this at our weekly small group Bible study.